Donate your body to science and you might end up on some aspiring artist’s canvas. Yesterday we drew skeletons. I have always found bones and skulls very uninspiring, mainly because I looked at them as worn out symbols of commercialised punk and all that. But now that I had two real skeletons in front of me hanging by wires and threads I suddenly saw the beauty. I was quite taken by all those swirling lines and and organic shapes, and the fact that we all carry such a genius maze-like construction inside of us. Or more accurate: that it actually carries us. It can even move in most ways imaginable. All in all I now think that skeletons are pretty awesome, and I hope you could tell from the drawings. This man I drew (we concluded it was man because his hips were quite narrow and high up) gave his body to science after he died. I keep thinking he probably hasn’t been watched as closely and carefully during his entire lifetime as after his death, now that he’s an art school model. A Polaroid camera takes cassettes that not only have 10 instant pictures inside, ready to roll, but also a pair of batteries that power the whole camera. I had the luck that the batteries in my first cassette went dead after 4 shots. It was kind of a bummer because those shots cost a lot of money (more than the camera) and now I wasted 6 out of 10. But then I discovered that even unexposed instant photos can be great fun, and even beautiful when processed by my finger and the back of a paintbrush. The colours that develop after you push the emulsion out of the pocket at the bottom of the ‘picture’ are amazing, and the structures, especially when viewed large, resemble the stuff you see on Google maps around the northern shore of Russia, only in pink and and grey hues! Assessments for drawing, painting and image development were all OK, so now we’re investing in all the new classes like 3D, graphics (etching, lithograph etc.) and photography. And still I don’t feel very comfortable taking picture of my work and putting it up here. I don’t know if it’s because it’s a lot harder to take a good picture of a piece of real work than it is taking a picture of a building, or that the problem is just that I don’t have a good story to go with the works. They all just exercises up until now, and even though I’m happy with most of them, I’m not sure how to present them. ‘As exercises’ is probably the answer to that. 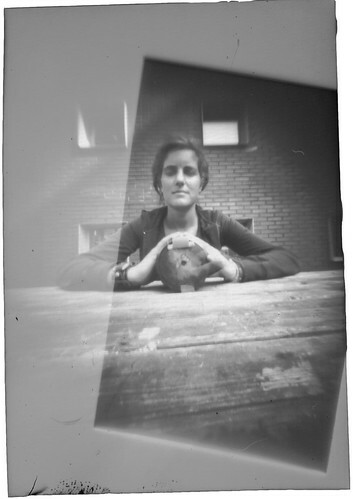 In the meantime, here are some more pinhole photos! I’m getting better at guessing exposure and all that (at least when the sun is brightly shining), and I’m teaching classmates how to do this now. Next step for me is a matchbox pinhole, with colour film! I’ll need an empty film canister for that, so that’s what’s holding me back right now. I haven’t got one. Plus, with 35mm colour film you have to shoot an entire roll before you can see the results, and because pinhole photography is one big learning curve, this could result in one entire roll of ruined pictures because your first assumption about exposure was all wrong, but you had now way to test it. Scary. It came as a surprise: I’m suddenly in art school for realz. I was doing the preparatory year, to make my mind up about which course I wanted to take (Fashion&Textile, Fine Arts & Sculpture, Photography, or all of the above) and make a better chance of getting accepted next year. But then some cards were shuffled, and I had a talk with the coordinator of the part time Fine Arts course, and now I’m in! Two weeks ago I felt like a grandma, being the oldest (by a couple of years) of all the students in the prep year, and last week I felt like a total fish because I was suddenly the youngest of the group. It’s hard to get bored like this, let me tell you. 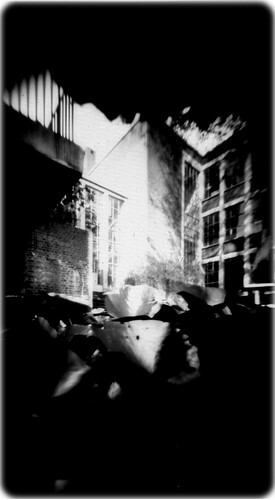 Just before I switched I made a lot of pinhole photographs, and they’re worth putting up here. These were made with two different ‘cameras’: a cigar box and a tin can that used to contain cheese snacks. The trick is to mount a tin strip with a TINY hole in it in front of a larger hole, put some paper negative (light sensitive paper that you can develop like film) in the back, seal the whole thing light-tight and leave it somewhere for a certain time. That time is the ‘shutter speed’. After that time you cover the tiny hole, get to a dark room and develop the paper that was in the box. And now you’re in for a surprise, because it’s pretty hard to figure out exactly what exposure works. Even when conditions remain unchanged sometimes 3 minutes is too long, sometimes 6 minutes is too short, there’s no telling. That’s annoying and neat at the same time. Because when you drop your paper in the developer and you start seeing these really crisp silhouettes, and gradually a fantastic image appears, that’s when you feel so good. I made some good ones and some of bad ones. You can check out all the ones that had a distinguishable image on them here.